Did you ever watch the TV series House M.D.? In that series the doctor and his team spent countless hours working with a single patient. They did everything they could to figure out and then solve the patient’s medical problem. Wouldn’t it be great if medicine really worked like that? Unfortunately, House M.D. 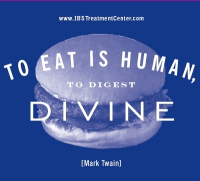 is a complete fantasy where IBS is concerned – unless you are talking about the IBS Treatment Center. Millions of people all over the world have Irritable Bowel Syndrome symptoms of diarrhea, constipation, abdominal pain, gas, and/or bloating. They see doctors, specialists, are sometimes hospitalized or go to emergency rooms, and have expensive scoping/imaging done. But in the end, most are told that there is nothing that can be done except try to manage their symptoms. In fact, the official position of the major medical organizations is that IBS is a functional disease that can be diagnosed on symptoms alone and has no cause and no cure. So once a patient is diagnosed with IBS, the standard of care is to only offer symptom management. Real medicine is almost never like TV. But the IBS Treatment Center is different. We really do have doctors who spend lots of time directly consulting with patients relentlessly pursuing a cure. We really do have diagnostic tools based on the best available science – tools most doctors have never even heard of and can’t provide. And the most important part – we do help the vast majority of our patients to find the underlying issues that are causing their IBS symptoms, treat them effectively and cure them. If you are interested in a really different approach to medicine, give us a call at 1-888-546-6283. « You Could Save Thousands If You Take Action Now!